First of all, Sorry! This post was meant to go up last week so you guys can prepare for the festivals. But then I fell sick! 🙁 I don’t know if this will be useful now, but since I had already drafted the post, I thought of publishing it anyway! Festive season has already started and we can feel the happiness and joy all around us in the air. Even if you are someone who don’t celebrate these festivals, you can for sure sense a lot of positive energy around you everywhere which can put you in a joyous mood. You might be celebrating this festive season with your family, or visiting friends and relatives, or going out for shopping, or dining out, or preparing a festive meal at home, or well, maybe just alone and bored at work (like me! 🙁 ) – no matter what, we want to look our best during this festive season. Maybe because we feel so happy! I am away from home and will be going home for Diwali just for a couple of days (as I don’t have leave). But even if I am at office, I want to look good during this festival time. I wanted to put together a simple beauty routine for a healthy, glowing and bright skin and for soft and shiny hair. 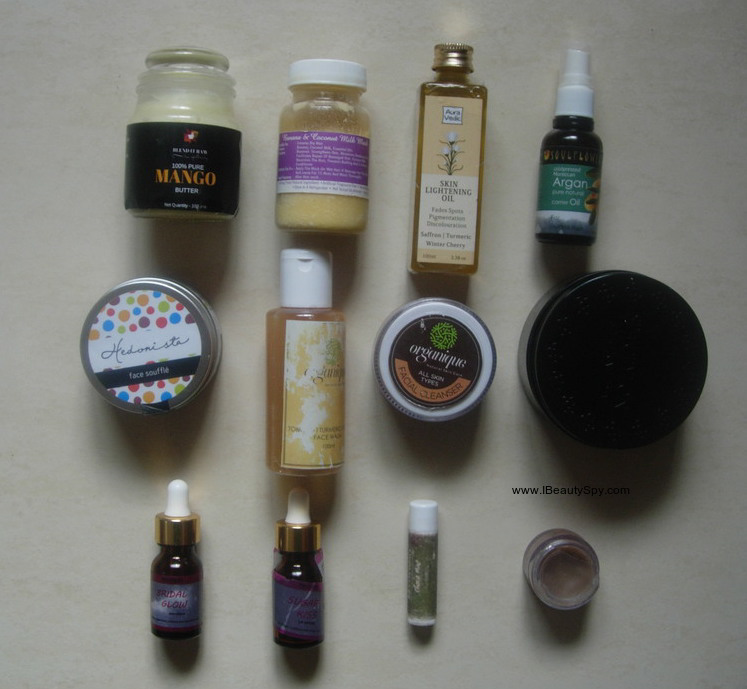 After many trials and errors, I narrowed down on some products which worked well and which you can treat yourself to on this festive season. Instead of going to parlours for expensive facials and hair spa, you can spend your money on these natural, organic products and see the results for yourself. I promise, you won’t be disappointed. Just in case, you are tight on budget, I have also listed some simple homemade DIYs for them which you can use as a substitute. 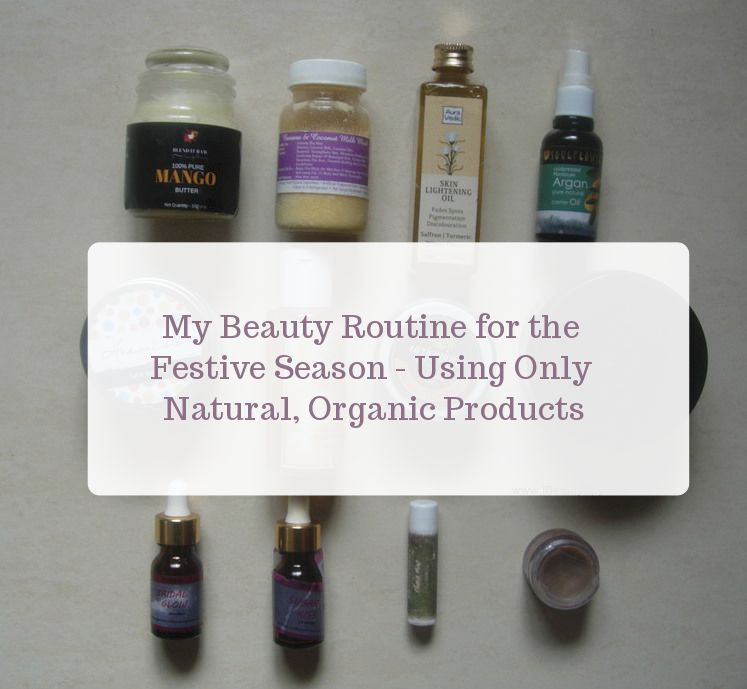 So here I am sharing my beauty routine for the festive season with you guys. Please note, I have not listed any makeup products. My focus is on getting a naturally healthy, glowing skin and hair using only natural and organic products. So while everyone around you has topped their face with tons of makeup, hair treatments and stuff, you will shine bright naturally like a star among them. Interested? Let’s get on to the festive beauty routine. Before I start, I would like to clarify am not listing down my entire CTM, scrub, mask routine. Am just sharing few products which has helped me in achieving a clear, glowing skin for the festive season. Let’s start with cleansing. I was looking for a good gentle, natural, soap-free cleanser which will also brighten my skin. And two products has helped me in that. The first is this face wash by Organique. It is completely free of any chemicals and contains only natural ingredients. Apart from cleansing my skin well, it also helps in brightening and clearing up my skin. Tomato, turmeric and honey is an amazing combination for clear skin and if you like soap-free, non-lathering face washes, you will love this. If you want a glowing skin, I would suggest you to deep cleanse your skin everyday. A dirty skin is just a dull skin. While cleansing, its not only important to remove superficial dust and impurities, but also deep cleanse the pores which accumulates oil, dirt leading to infections. Following the above face wash, I use this Organique Facial Cleanser which comes in a powder form. I just mix it with some curd and apply on my face and leave on for 5 minutes and then wash off. This helps in really deep cleansing and unclogging your pores and the natural ingredients bring a radiance and brightness to your face. If you want me to do a detailed post on a step by step process of how to deep cleanse your skin, let me know in the comments below. If you don’t have this, you can use simple besan flour to cleanse your skin. Incorporating a serum in your routine can make a huge difference to your skin. Insta Glam Beauty has a whole lot of interesting serums. I chose this one as I was looking for glow-boosting products. You don’t need a bridal glow serum only if you are a bride. Don’t you want to look like a bride everyday 😋? Insta Glam Beauty Bridal Glow Serum, true to its name, gives a nice glow and illuminates my skin. Also with regular use, it has helped to fade acne scars. It contains a blend of so many good-for-skin carrier and essential oils. And I am really impressed with the quality of this serum. I would do a detailed review on this soon. If you are looking for good serums, I would suggest you to check out their page. They have 6-7 variants of serums alone! Clay masks help to draw out impurities from the skin and helps serums to penetrate better and work their magic. Since I have dry skin, I use clay masks only once a week. If you have oily skin, you can use it 2-3 times a week. I like to use Hedonista Chocolate & Rhassoul Clay Face Souffle as it helps to detoxify as well as nourish my skin. It also removes tan and gives a healthy glow to my skin. If you love chocolates, you will fall head over heels in love with this. It just feels like applying chocolate paste on your face. Let me know if you want a detailed review on this. A simple DIY is to mix some kaolin clay, rose petals powder and activated charcoal. Every morning, before leaving for office (I take a long time to get ready for office, do you too? 😊 ), applying a lip balm is my final step. Recently I purchased this Juicy Chemistry Choco Mint Lip Butter. Its little pricey, but believe me, once you have used it, you would say its totally worth the money. Made of all nourishing butters and oils, this is one of the best lip butters I have used. Don’t forget your lips this festive season! You want to flaunt a nice red lipstick before meeting some guests? Prep your lips with a lip scrub before applying a lip balm and lipstick. You can use a homemade brown sugar and coconut oil lip scrub or try any ready-made ones from brands. Am currently using the Vert Cane Sugar with Kokum Butter Lip Scrub. And its so yummy! It helps to exfoliate dead cells revealing soft, pink lips. This is the last thing I do before hitting the bed. My lips are darkened and pigmented as I haven’t used SPF lip balms for a long time. So I got this lip serum from Insta Glam Beauty (If you haven’t yet checked my latest haul, do check out here). Its an oil-based serum and contains a blend of so many good oils. I mix this with a little bit of Blend It Raw Beauty Mango Butter and dab on my lips. It nourishes my lips and prevents dryness and flaking. If you don’t have this, just rub some butter or ghee on your lips. Twice a week, I use a body scrub. You can use a simple DIY besan flour + orange peel powder + curd scrub. I like to treat myself with the Spa Ceylon Forest Trail Body Scrub (don’t we deserve a pampering atleast twice a week? 😊 ) which is an ayurvedic blend of organic lemongrass, eucalyptus, patchouli, peppermint, cedarwood, vetiver, cardamom, margosa, gooseberry, walnut, etc. It makes my skin so smooth and soft. Not just your face. Your body too needs to be glowing right? I have now stopped using body lotions and instead use Auravedic Skin Lightening Oil. It’s a very light oil and contains saffron, turmeric and winter cherry which helps to brighten skin and remove tan. It also keeps you skin soft and supple. Plus its super affordable. I have literally no words for this! If there is one product that you would ask me to recommend in this entire list which can be used for glowing face, body, hair – then just grab this. I have already repurchased two more jars of this. I will do a detailed review on this soon. I use this as a hand cream, foot cream and it gives me results like no other body butter ever. And the texture of this is to die for! There are just two products I have added in my regular hair care routine. I wanted shiny and nourished hair. But didn’t want to use hair masks and serums loaded with silicones. So what’s my pick of natural products? Banana and coconut milk sounds exotic, right? I do this deep conditioning treatment once a week. And it works wonders on my hair. If you are looking for a simple DIY at home instead, you can try a mashed banana + honey + olive oil hair mask. It will surely make your hair more healthy and shiny than the store-bought conditioners and masks. My hair remains well hydrated and moisturized for two days after washing. From the third day, the frizziness happens and I start using the Soulflower Coldpressed Argan Oil. I apply it on my hair lengths and tips. Make sure you apply only 1-2 drops as too much might make your hair oily and limp. This helps to smooth my hair and combat frizziness and help detangle easily. A good product to flaunt lustrous and shiny hair this festive season. I’ve never tried any of these products, but they sound very promising. I would love to pick up a few from these in my next haul. Btw does the soulflower Argan oil works for hair fall and hair growth? Is it worth buying? I haven’t tried Argan oil for scalp, Safiyah. Am just using it as leave-in serum to tame frizzy hair. And it works good for that. I want to try something from Organique, will go with your suggestion! 🙂 By the way, how are you now?